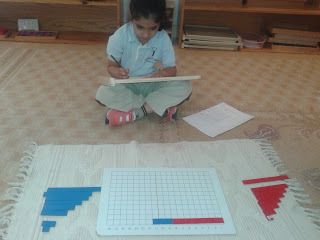 In our class, when a child of two and a half comes, he already posses the MATHEMATICAL MIND. "The Mathematical Mind’ refers to the unique tendencies of the human mind", Maria Montessori . She was familiar with Blaise Pascal, a French philosopher, physicist, and mathematician, who theorized that “man’s mind was mathematical by nature and that knowledge and progress came from accurate observation” (The Absorbent Mind, 17, pg. 169). So a little child starts exploring things in his environment ,getting the idea of shape, size, length, height, colour, sorting, and dimensions . working with the BROWN STAIRS, AND GETTING THE MENTAL PICTURE of decreasing width and size. working with PINK TOWER gives him the exactness of height and decreasing size ,preparing the mind for future maths. achild can explore many things in a MONTESSORI CLASSROOM , where balance and freedom emerges in a unique form.Here she is getting the basics of geometry all SENSORIALLY. Counting actually never starts but only after a child discovers himself the PORPOSE of it in his real life. And it goes on ;the process of unconscious discovery of mathematics in a child's mind. And the developement of Mathematical mind is going on. 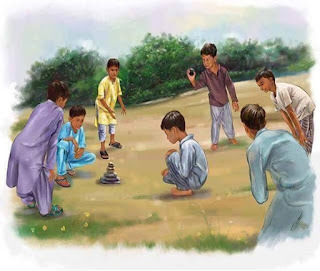 Be it a sese of order, design , sequence ,a child is always an intellegent builder . Making a puzzle, a pattern , or anything related to sense of order always lead to a Mathematical mind. Only after such a sequence of INDIRECT preparation of maths, we start this simple RED RODS, developed by MARIA MONTESSORI to introduce the concept of counting formally to a child. And here the Numerals are formally introduced, only when the concept of counting is mastered. When a child is given an opportunity to Touch the Written SIGNS ,his hands not only remembers the PRINTS in his mind but it is incarved there for ever. 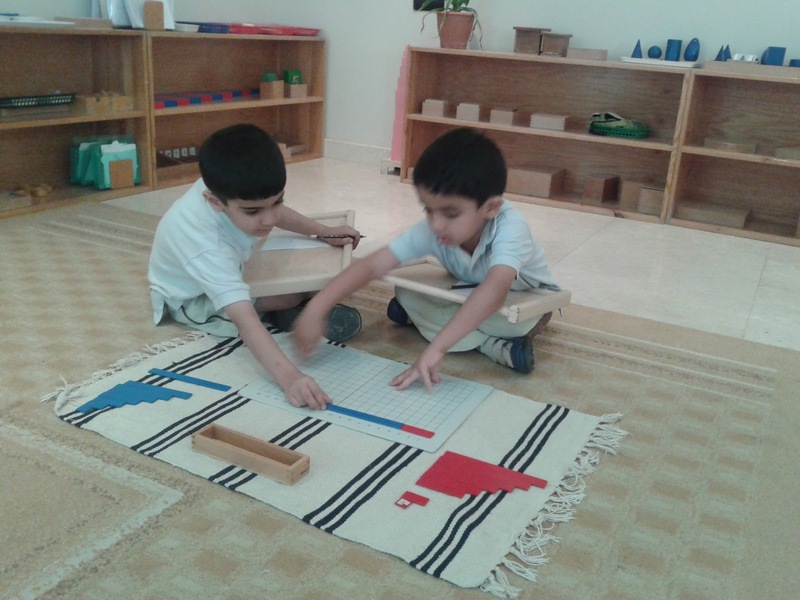 In a Montessori class, a child is given SAND PAPER LETTERS AND NUMBERS so that he can touch it with his fingers and then make Impressions on a Sand Tray, and only then he uses EXTENTIONS like pencils, markers, chalks to write on paper, blackboard or white boards. 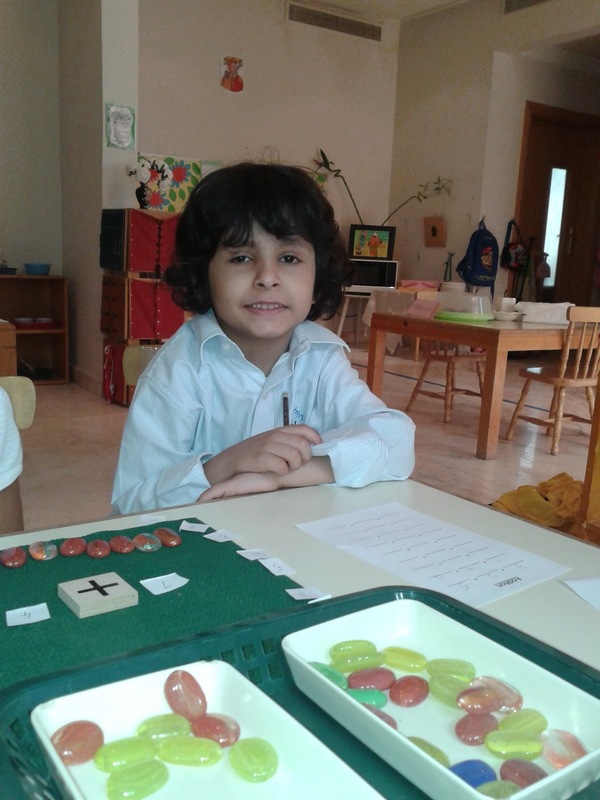 After a strong connection is being built between number and numerals, a child is taken a step ahead of arranging the numbers in a specific order ,making his mind to get the concept of ODD AND EVEN NUMBERS. And here the concept of ODD and EVEN numbers are easily understood . The concept of CONCRETE is being transfered to a paper ,and now he can easily understands that everything in his environment can be tranfered to a paper( First lesson of Abstraction). The next stage is without any CONCRETE stuff, mind is working all in an Abstract term. to form a foundation for ADDITION AND SUBTRATION later on. The best material of Montessori Maths is GOLDEN BEADS, here the child is given the concept of UNIT, TEN, HUNDRED and THOUSAND, all in one beautiful presentation unlike other traditional systems where it takes a long long time to get into THOUSANDS. Here the child is busy learning the cocept of TEENS with the help of GOLDEN BEADS and then relating it to it's coresponding numerals.Amazing Montessori materilas! 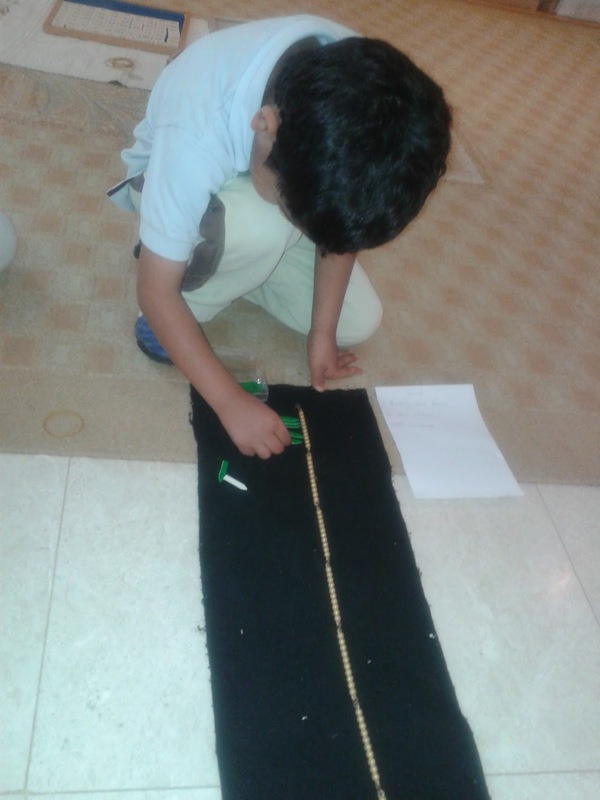 Now the concept of TENS is being learned using the same GOLDEN BEADS and then making the exact numbers for them. The transfer of concrete into paper makes lots of sense for a child who was gone through the material using his/her hands. 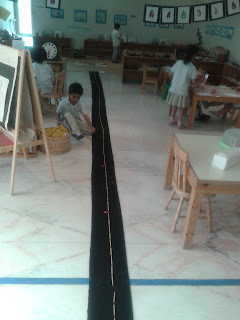 Here the children finished their HUNDRED BOARD , all by themselves and in their first attempt, its all because the base was very strong uptill here .So the transfer of concrete to abstract is a simple , easy and smoth process in a Montessori class . The LONG lesson of GOLDEN BEAD TO show unit, ten, hundred and thousand till 1-9. ,10-19,,100-900, and 1000-9000 . 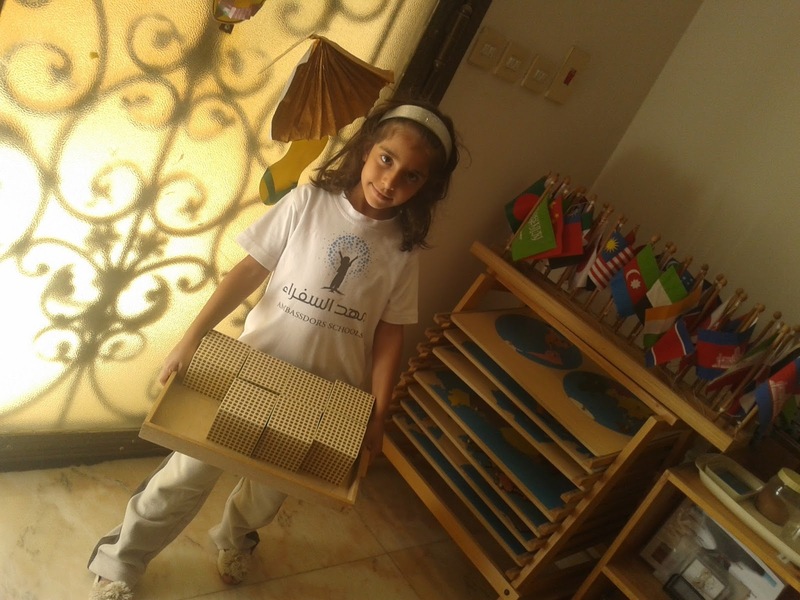 Children not only get the concepts but love the lesson to do it again and again untill they attain mastery. Here the Golden Beads lesson is shown with its NUMERALS ,CALLED large number cards, It gives the BEAUTIFUL concept of Decimal System to a Five years old . The Montessori Maths doesnot ends here , it goes on with many more amazing Concrete materials .The process is simple, easy to difficult, concrete to abstract ,and the child 's mind is ready for all the Operations of Addition, Subtraction, Multiplication and Division. Montessori not only developes Mathematical mind , it creates the most reasoning ,logical ,accurate, and orderly MIND which is the base of all Creativity related to science. Montessori Directress always create a her own Maths materials to add more flavor, here this child is learning Addition using the colored Marbles. 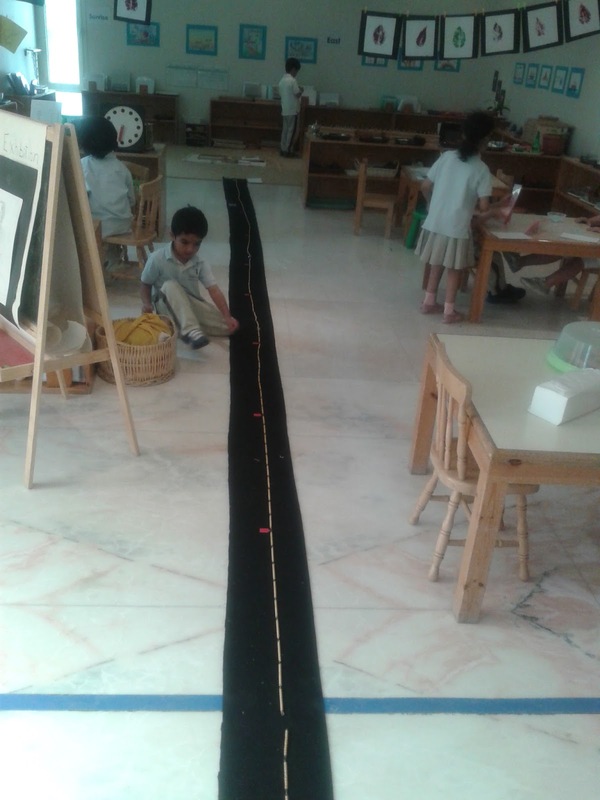 This is another Hands on material called "Addition Strip Board" which stimulates the child's mind to make his own Addition Table using this simple but brilliant Montessori material. (my children love this material and learn all the basic Addition tables not by memorizing but by doing it by themselves). These kids are doing the Addition Table of 3 by discovering on their own . This child is adding using the STAMP GAME. Typically it is used by children (ages 4-7) for both static and dynamic addition, subtraction, multiplication and division. After being introduced to the process of the decimal system using the golden bead materials, the Stamp Game provides opportunities for individual practice in the operations of addition, subtraction, multiplication, and division. In a step towards abstraction, the quantity and symbols of the decimal system are combined and represented by each stamp. Doing the 100 and then 100 Bead Chain lesson using the Golden Bead chain and Arrows to count the perfect 1-100 counting and then counting by 100 leading it to the 1000. Montessori Maths lessons are just an amazing way of discovering Mathematics using 3-D materials. The Montessori Maths does not ends here , it goes on with many more amazing Concrete materials .The process is simple, easy to difficult, concrete to abstract ,and the child 's mind is ready for all the Operations of Addition, Subtraction, Multiplication and Division. Montessori not only develops Mathematical mind , it creates the most reasoning ,logical ,accurate, and orderly MIND which is the base of all Creativity related to science.